With Cincon continued focus on the development of Railway application market, we are here to introduce our latest product design, the DC/DC CHASSIS MOUNT CHB300W-110SXX-CMFC(D) Series. 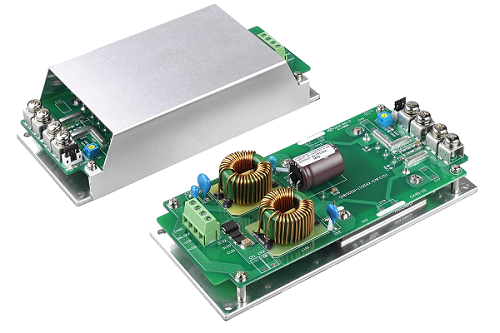 With a wide 4:1, 43~160Vdc input range, this new product is chassis mountable DC-DC converter offers 300 watts of output power @ single output voltages of 5, 12, 24, 28, 48VDC and 3000VDC basic isolation. It has a very low no load power consumption requirement of 15mA. Efficiency can go as high as 90.5%, and has a case operating temperature of - 40°C to 100°C. An external heatsink is required to expand the full power range of the product. Other features include remote on/off (positive or negative) and ±10% adjustable output voltage. The chassis structure offers built-in EMI EN50155, EN50121-3-2 filter, and meet EN45545-2 requirements for the essential railway market needs. Also, it is approved for UL60950-1 2nd (Basic Insulation) for DC modules. Fully protected against input UVLO (under voltage lock out), output over-current, output over-voltage and over-temperature and continuous short circuit conditions. Although the product was primary design for all common railway applications, it is also suitable for other markets such as industrial, telecommunications, battery operated equipments, and distributed power architectures.